You are driving on North Market Street in Jacksonville headed home from work. You briefly look down at your phone and start typing a text. Suddenly, an intoxicated driver veers into your lane in the opposite direction causing a collision. You suffer serious physical injuries from the wreck. Is the fact that you were texting while driving going to prohibit you from pursuing financial restitution through a personal injury claim? In Florida, the answer is no. Florida adheres to a “pure” comparative negligence standard. Basically, this means that whatever amount you were negligent, your financial recovery will be reduced by that percentage. In the hypothetical discussed above, let’s say you file a personal injury claim that winds up going to trial and a jury determines that you were 25 percent negligent in the cause of the collision. This means that any damages awarded to you would be reduced by 25 percent. For example, a $100,000 verdict would be reduced to $75,000. Negligence standards are governed by state law, which means that states can adopt and apply different standards when assessing liability in personal injury cases. Take, for example, the Commonwealth of Virginia. This is a pure contributory negligence jurisdiction. This is probably the harshest doctrine a state could adopt in the field of personal injury law. 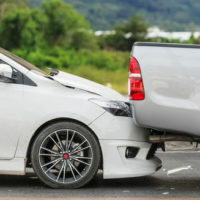 Basically, contributory negligence stands for the proposition that if the jury finds you were even just slightly negligent and that contributed to the accident, then you receive nothing. This means you could be just one percent at-fault while the other driver was 99 percent at-fault, and you still could wind up getting nothing from a jury. As mentioned, Florida is a “pure” comparative negligence jurisdiction. In contrast, some states adhere to a “modified” comparative negligence standard, requiring a showing of fault that meets a 50 percent threshold. This means that you cannot recover against another driver if you were 50 percent or more at fault. Georgia adheres to this doctrine. There are other states that adopted a harsher 51 percent threshold. This effectively means that a plaintiff must have sufficient evidence to show that the defendant was at least 51 percent at-fault for the accident. If you cannot reach that threshold, you recover nothing. The Florida legislature adopted the comparative negligence standard in the 1970s. The rationale was clear and accurate – causes of accidents are not always black and white and it is fair and reasonable for each responsible party to shoulder their portion of the blame for causing a collision. As you can see, assessing what legal standard needs to be met to establish liability on the other driver ca get complex. That is why you should contact Florida and Georgia car accident attorney, Charlie J. Gillette, Jr. as soon as possible. After reviewing your potential case, Jacksonville personal injury attorney Gillette can counsel you on the next steps and help you understand your legal options. Contact his office today to schedule a free consultation.